Women starting first-line chemotherapy for advanced breast cancer have differing baseline characteristics and survival times. We sought to develop and validate a pragmatic prognostic nomogram to predict overall survival (OS) by using available clinical and laboratory data. The prognostic model was developed in a training cohort (n = 693) from two first-line chemotherapy trials (ANZ8101 and ANZ8614) and validated in two other trials (ANZ0001 and ANZ9311) with 324 and 233 patients, respectively. The proportional-hazards model was constructed from pretreatment demographic and disease characteristics. Patients were classified into good (score <88), medium (88–157), and poor (>157) prognostic groups. A nomogram was constructed (n = 1250) from the combined datasets of all four trials, based on the predictors identified in the training cohort. The nomogram predicted OS with a concordance index of 0.65 (95%CI, 0.62–0.67). Factors in the nomogram were age, performance status, estrogen receptor status, number of involved organs (lung, liver and brain), hemoglobin concentration, neutrophil count, and serum alkaline phosphatase. The median survival for good, medium, and poor prognosis was 15.4 months (95%CI, 12.7–19.1), 10.2 months (95%CI, 9.0–11.6), and 6.1 months (95%CI, 4.4–6.7), respectively. The actual and model-predicted probabilities of 18-month survival agreed well, after recalibration for the new baseline survival functions for each validation cohort. 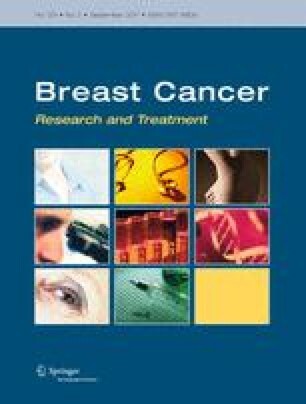 A nomogram combining seven readily available baseline characteristics enabled stratification of advanced breast cancer patients into three groups with significantly different survival times. This nomogram could be useful for individualising treatment and for stratifying patients in future randomized trials. We thank Ms Rhana Pike for the editorial support. This study was supported by National Breast Cancer Foundation Doctoral Research Scholarship for Dr CK Lee.